Ahh…Sun Valley. This is a wonderful place where you feel pampered and privileged. Baldy is a surprisingly steep mountain and the runs are very long. I (Ron) was last at Sun Valley in 1973 as a child learning to ski, so this was a homecoming of sorts. We drove into Sun Valley from the desert sagebrush of southern Idaho at night so didn’t really know what to expect. They had only received about 37″ of natural snowfall so far in the season, and we were there during the super-busy Christmas-New Years week, on a Sunday. It was a quick one-day excursion on our drive back from Jackson, WY. Sure enough, when the sun came up the next morning the mountains around us looked pretty brown. We were staying in Ketchum really close to the River Run access and the drive was only a few minutes. River Run has a lot of parking and a gondola and is the preferred starting point. From the top of the gondi we went straight over to the newest area of the mountain — Seattle Ridge. It’s a north-facing mellower ski pod than the rest of the mountain. We found the greens there to be similar to easier blues elsewhere. 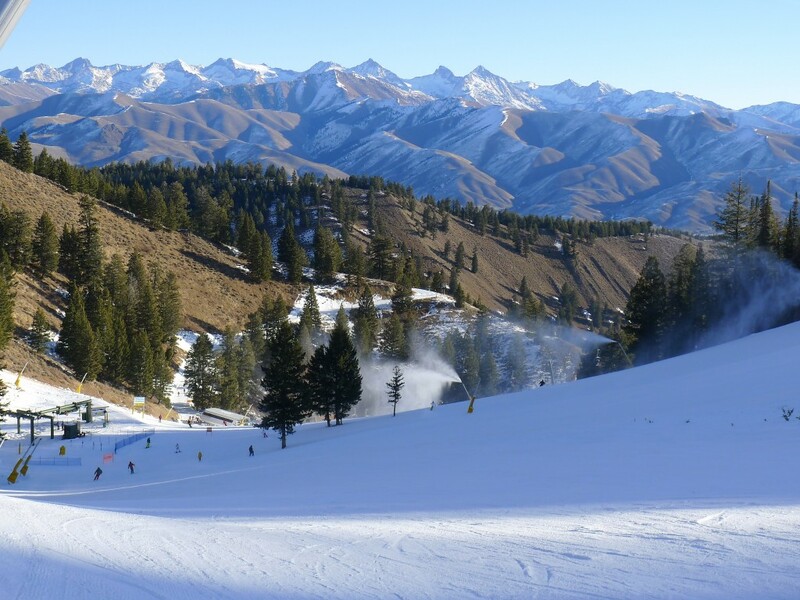 This is where we discovered something unique about Sun Valley vs most other western resorts — the snowmaking. They have automated guns on all the major runs, and they run them 24-hours a day. They rotate among the more popular ones during the day to freshen up the surface, and it makes a huge difference. When it doesn’t snow for weeks at other places it becomes a skating rink, but at Sun Valley it was pretty awesome. The grooming and slope preparation there is second to none. Seattle Ridge gets crowded early, so we headed back to ski the runs on River Run before lunch when the line started to build. We did not encounter any other lines on the rest of the mountain. At River Run we learned about the other unique thing that Sun Valley offers with is very long runs with large vertical drops. The Lookout Express chair is 2,600′ and the Challenger is over 3000′. Along with the great grooming and lack of lift lines, it is easy to rack up a lot of vertical in a short amount of time. 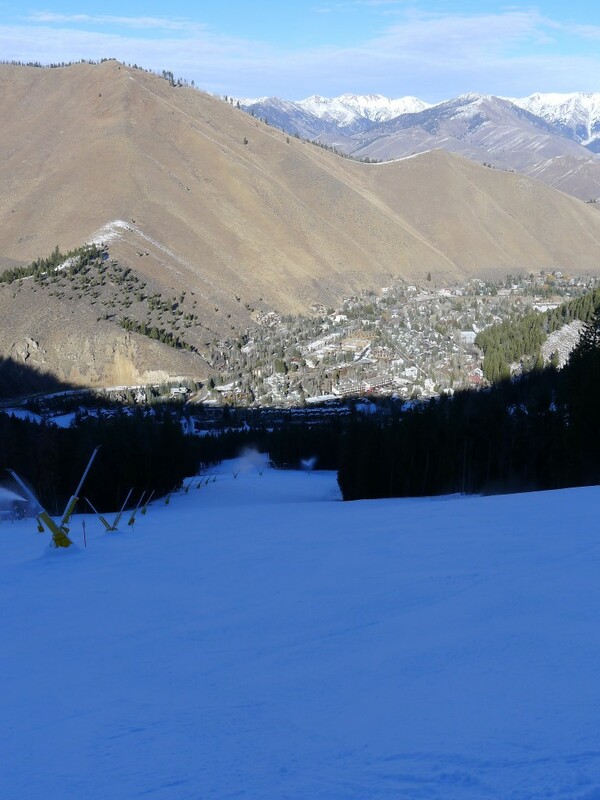 A lot of the runs at Sun Valley are either on ridge tops or in gullies. The gullies are fun because you can use them as natural half pipes. We had lunch at the base of the Warm Springs area and found the food to be great and surprisingly cheap. We paid only $13.50 for lunch. We noticed this when we skied Snowbasin in Utah as well. They are owned by the same company. The lodges are spectacular log construction and the bathrooms are the best we have ever encountered at any ski resort. There was only one black run open due to the snow conditions, but it was fun with huge moguls at the top and groomed loose snow for the lower 2/3rds. It took us until after 3PM, but we did end up skiing all the major runs. The Frenchman’s area was particularly fun in the afternoon because it was completely empty and had a nice variety of runs open. 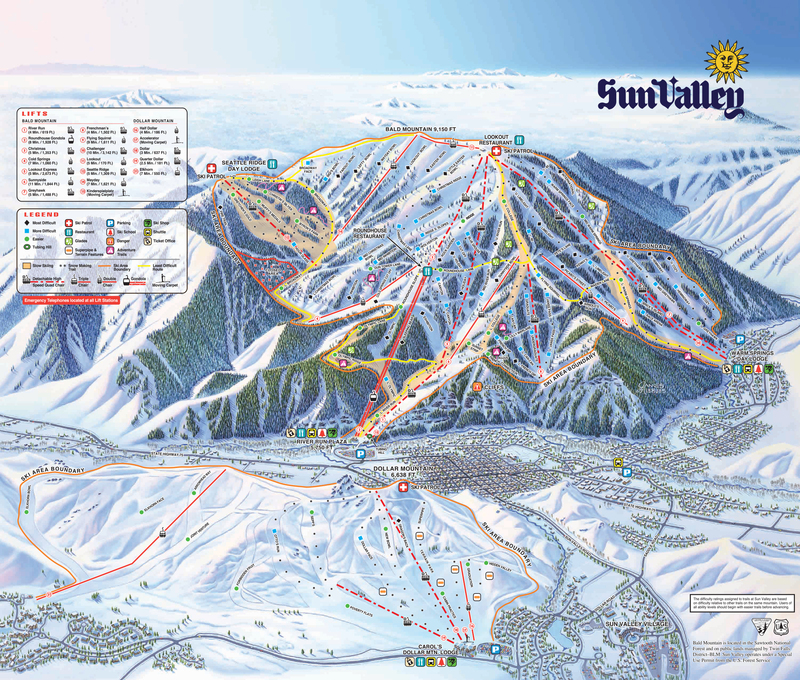 Sun Valley is unique for it’s long fall-line runs and lifts that bite off a lot of vertical in one ride. The grooming is fantastic and their snowmaking is second to none. The town of Ketchum is charming with a great main street to walk down. 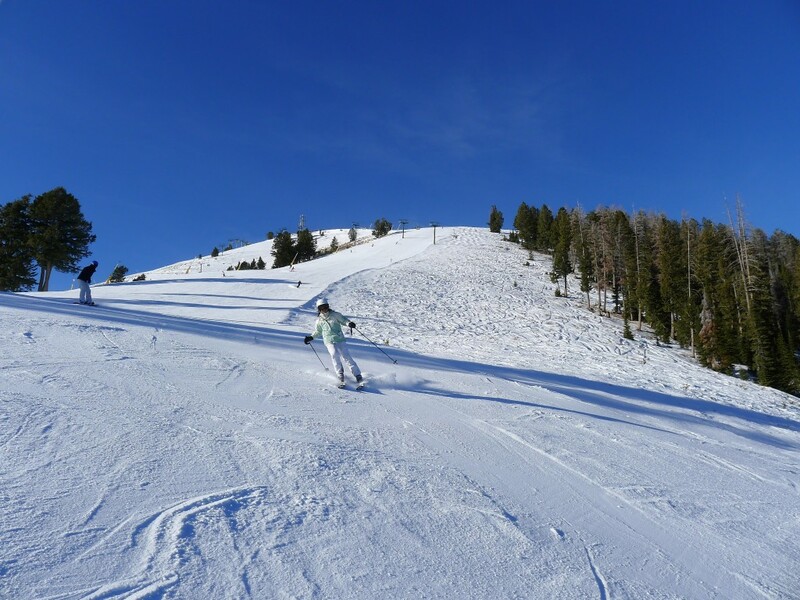 Since it is a steep mountain, most people end up skiing on the few green runs like College and at Seattle Ridge. This makes it crowded and icy when you need to go on those runs. College in particular is bad because it is the only way to get to certain areas. More natural snow would certainly make things better and more scenic. Looking out on brown mountains when you are skiing is not exactly what you look for in a ski vacation. For dinner, go to the Pioneer Saloon on Main Street in Ketchum. The typical wait is over an hour, so plan accordingly. It’s a piece of Sun Valley culture and makes for a fun time. We had a blast skiing the really long runs like River Run and Warm Springs. The scenery changes as you go down and makes for a very interesting experience. We definitely want to go back. Next time we need to spend more time there. We would plan on about 3 days next time so we can ski the whole mountain. We will definitely wait for a heavy snow year when the whole mountain is open. If that happens, Sun Valley would be hard to beat.